A short book arguing that film gets much of its story-telling technique from similar and earlier literary techniques; that film is a sort of visual literature. Paperback ed. 1972. Ch 5 “Verbal and Visual Languages” reprinted in Fred H. Marcus, Film and Literature, Chandler Pub. 1971. A ch. was also reprinted in Take One, a Canadian film journal. Ch. 7 has been reprinted in John Harrington’s Film and/as Literature, Prentice-Hall, 1977. Most of ch. 8 is reprinted in Federico Fellini: Essays in Criticism, ed Peter Bondanella. The book was reprinted by Garland Pub. 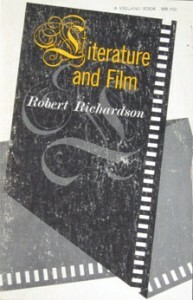 In 1985 as a title in their Cinema Classics Series. Excerpts are reprinted in Twentieth Century Literary Criticism, Topics vol. 38 ed. Paula Kepos, Gale Research, 1991. A Korean translation is forthcoming from Dongmoonsun Publishing Co in Seoul, South Korea.